"Bite Back! were always keen on the mini-album format and as we had released a 12" vinyl mini-album in 1988 (Maxim) it was suggested we do the same on video. 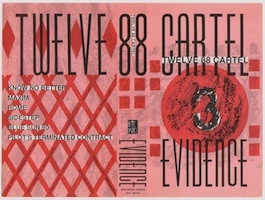 Twelve 88 Cartel had always used a lot f film and video in live performances. Our usual distributor (Backs) were unsure about the video format which is why the label approached Ikon. Of the six tracks, three were exclusively written and recorded for the release ('Know No Better', 'Sidestep' and 'Pilot's Terminated Contract') and apart from 'Rome' and 'Maxim', they were recorded at Crystal Studios in Southsea and produced by Steve Hoff. 'Rome' and 'Maxim' originally appeared on the Maxim album and 'Blue Sun 90' on Tension Crush EP, the final TWELVE 88 CARTEL release. The video was shot and edited by the band and post-production was done by Nick Elborough at Amity in Farnham, Hampshire.